TORONTO - Afshin Rahimi was used to cooking and doing laundry while at home in Iran, but faced a fresh set of challenges after leaving the country to study abroad. "Before, my focus was more on my studies, but when I came here, I had to balance it," said the 25-year-old graduate student. "I had to go grocery shopping, I had to pay the bills, I had to deal with the managers and all that. And on the side, I had to do assignments ... do the research, deal with the professors and all that." Rahimi is currently completing his PhD in aerospace engineering at Ryerson University in Toronto, sharing a one-bedroom apartment a stone's throw from campus with breathtaking panoramic views of the downtown core. His current dwelling is a marked improvement from the apartment he lived in when he first arrived to pursue his master's. "We got a lot of cockroaches and then we got bedbugs, so that was not very convenient," Rahimi recalled. In January of 2011, he switched over to the master's of science program which offers scholarships and teaching assistant opportunities. But Rahimi admitted the first few years as an international student proved difficult financially, with hefty tuition fees in addition to living expenses. Part-time work included stints working as a tutor and in a call centre in addition to his role a peer supporter with International Student Services at Ryerson. Rahimi and his roommate spent $1,000 between them on essential home furnishings, but found other ways to scale back. They opted for a student plan for home Internet access, crafted curtains and made the vast majority of their meals at home. Despite the challenges, Rahimi said the chance to live on his own has been beneficial in his personal development. "You don't always have your parents to protect you, so you need to grow and learn how to protect yourself." 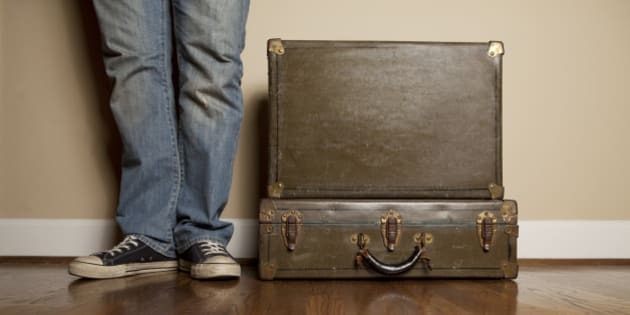 Even in their physical absence, parents can still lend key moral support to kids primed to leave the nest, said Cindy Babyn, author of "Moving Out! A Young Adult's Guide to Living on Your Own" (General Store Publishing House). "They can frame moving out in a very positive manner saying: 'Oh, this is a great opportunity for you,' while at the same time reminding them that they're just going to be one phone call away or one email away to help them out if the money gets tough or if things get stressful with the roommate or landlord, or if they just don't know what to do," she said. The author shares some tips for youngsters pondering or planning to live away from home. 1. Location, location. There's obvious excitement that comes with the prospect of having a place to call your own, but Babyn said assessing the physical environment beyond the walls is also key. "I would suggest youth really do spend time looking around the neighbourhood, around the apartment where they're going to be," said Babyn, adding that househunters should determine proximity to transit, the laundromat and other essential services. Observing neighbours who are generally out and about is usually a sign of a good, active community that can help you feel safe, she noted. "You'll get into some neighbourhoods and just feel a super-bad vibe," said Babyn. "The thing is, (the accommodations) may cost less, but it doesn't help you to feel good about coming home." 2. Manage your money. "Besides the emotional stress of the unknown and going out on your own, one of the major stressors is the financial aspect," said Babyn. "Youth should know in advance that they are choosing to go into a place that they can afford." In "Moving Out!" she outlined a sample budget forecast, working with a $2,000 monthly income and a list of potential expenses. "Can you afford the rent? Can you afford the Internet? What's your cellphone bill going to be? Things like: 'What's your transit pass going to cost? Did you factor in the laundry costs? What about the odds and ends?'" said Babyn, pointing to extras like banking fees, haircuts and dining out. Babyn said parents or guardians can encourage young people to save a moving fund ahead of time to deal with some of the upfront costs such as first and last month's rent and installation services, like Internet setup. If possible, it's also generally recommended to have three months worth of living cash set aside in the bank as an emergency fund, she noted. 3. Ways to save. In addition to making coffee and meals at home, Babyn recommended scaling back on gift-giving if money is tight. Going for a walk or cooking a meal for your family is a way to spend quality time together without doling out a lot of cash, she noted. While some may opt for apartment content insurance to cover estimated costs of replacing damaged goods, Babyn said it's important to assess if the monthly fee is to their particular benefit. "If you've bought a dresser off Kijiji for $50 and maybe you've brought your bed from home and you have some kitchen things like a coffeemaker, well, these things aren't valued at a whole lot of money," said Babyn. "By the time you finished paying insurance for a year, you might have actually paid more than what the contents are worth. That's the thing to check out." 4. Pick the right roommates. Before setting up house, Babyn said it's critical for individuals to be honest about who they are and their expectations for the home to ensure they're well-matched with roommates. "If I want to go to bed at 10:30 p.m. and my roommate is just getting their energy up at 10 p.m. — so they want to walk around, they want to cook, they want to watch TV, and they want to turn on the music and it's one in the morning and you want to try to get your sleep — this is a recipe for disaster," she said. Frank talk about finances also helps to ensure you're paired with someone that has the "personal integrity" to pay the bills each month, Babyn noted. "Have these really good conversations in advance. It will probably spare you a lot of stress."